Together we can create a world without bullying! The event kit is designed so that anyone can set up a display with print resources to educate and engage participants about steps each one of us can take to help prevent bullying. Idea Guide: Step-by-step information on how to use the event kit, along with creative ideas to share the resources with participants. Posters: A series of high impact, colorful visuals to display at the table or event to encourage everyone to help create a world without bullying; five posters, 24 x 36 inches. 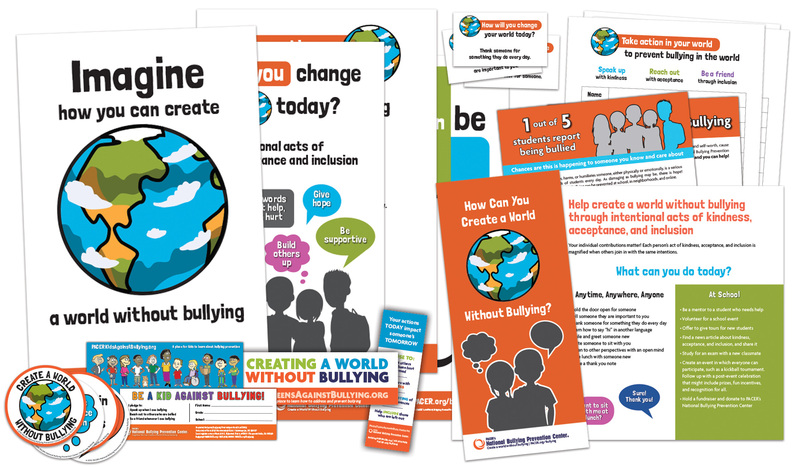 Brochures: Informational handout providing ideas on how to help create a world without bullying; 50 brochures. Cards with Intentional Acts: Business-size cards with suggestions for intentional acts of kindness, acceptance, and inclusion which anyone can do; 100 pre-cut cards – average two per person. Pledge: A fill-in-the-blank form on which participants can add their names to show their support; 5 pre-printed sheets provided, photo copy as needed. Decals: Participant take-away item with the campaign message and call to action; 50 round stickers that are 3.5 inches in diameter. Pencil: Participant take-away item with the campaign message; 50 #2 lead pencils. Informational Flyers: Colorful, informative 8 ½ x 11-inch flyer (2-sided) outlining the creative resources, outreach activities, and opportunities available from PACER’s National Bullying Prevention Center; 50 flyers. Bookmarks: A creative way to encourage elementary school students to “Be A Kid Against Bullying” and encourage middle and high school students that “Together we can create a world without bullying;” 100 bookmarks of each of the two versions.